It happened – daylight savings. Longer days are FINALLY here, Spring, just a couple of weeks away. I can already feel a new sense of energy, excitement for everything to come with warmer weather. We’re all ready to get out of our homes and into the sun, at least us New Englanders. Speaking of excitement, Saltwater Farm Vineyard was awarded a coveted slot in the top 50 Romantic Wedding Venues in the U.S. by Brides magazine!! As a former bride and current staff member, I couldn’t be happier for the Saltwater family. This weekend rocks. Unexpectedly, we decided to hit happy hour on Friday at the Oyster Club in Mystic. The storm had let up, I was home on the early side, and it felt like a great night for some vino and buck-a-shuck oysters. The bar was slammed when we got there, apparently everyone else felt the same way. I couldn’t be mad, it’s the place to be if you want a cool relaxed vibe to let the week before slip away. By happy chance, we ended up bumping into a friend and making new one’s. Nothing brings people together like good food and good wine, nothing. Saturday morning we battled through a slight haze to get our house ready for a showing and to revisit one we had been to once before. I was feeling rough – every time I wake up in that condition I hear my dad saying (and this is seriously corny…) “If you want to hoot with the owls, you have to soar with the eagles” yup he’s right. Soaring with the eagles included Keiko yacking in my car – a full breakfast of dry food. Good thing I spread a super thick beach towel on my back seat first, I’m no fool. I am, however, a sympathy puker…. crisis averted this time. UGH! As it turns out, we really like the house. Tonight our agent presents an offer and we’ll see what happens from there. I’m so close to a bigger kitchen! What’s meant to be will be – firm believer. Anyway, I had every intention of making clam chowder for dinner yesterday but changed my mind the second we put the car in park at the grocery store. 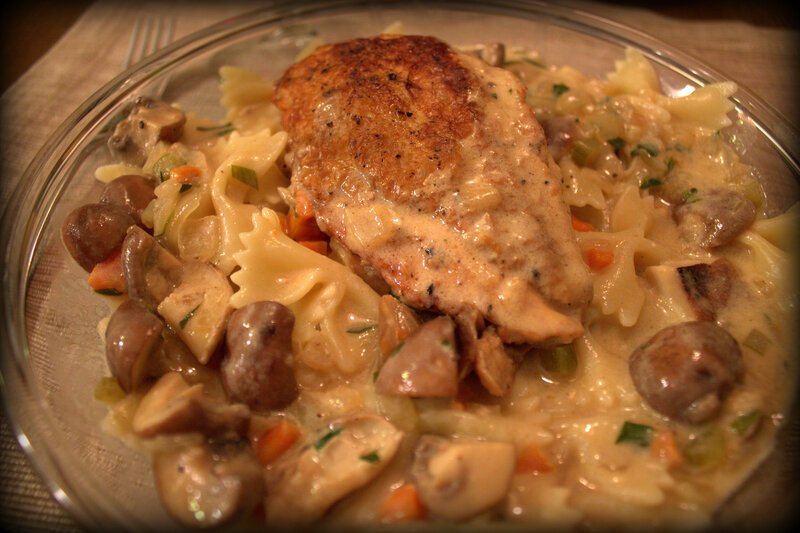 Chicken Fricassee had to be made, even though we had both been craving chowder for two full days. I’m suddenly annoyed at how misaligned my placemat’s are, grrr! 3 tablespoons unsalted butter – softened. If you don’t have poultry shears I highly recommend that you get a pair. Flip your bird over, breast side down. I used a paring knife to trace along either side of the spine, this is where you are going to cut. 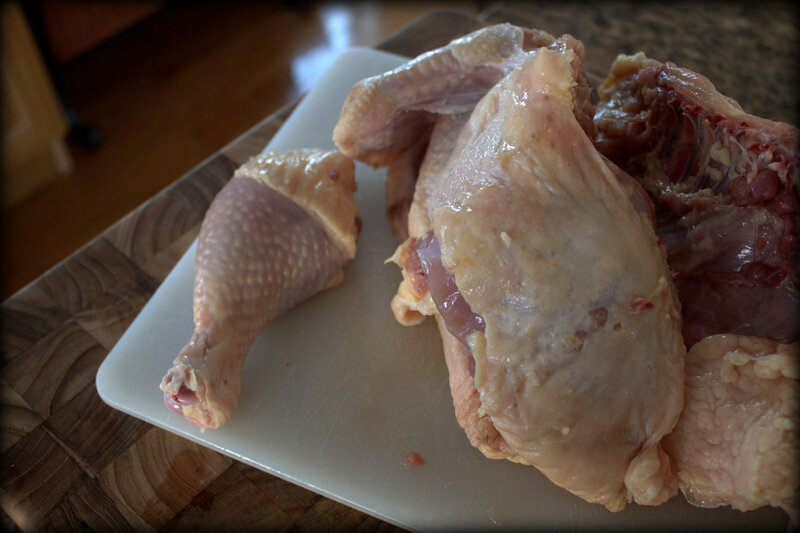 Now that the spine is removed, you can easily cut the drumsticks, thighs, wings, and breast meat. Note to self – it’s time to do my nails. 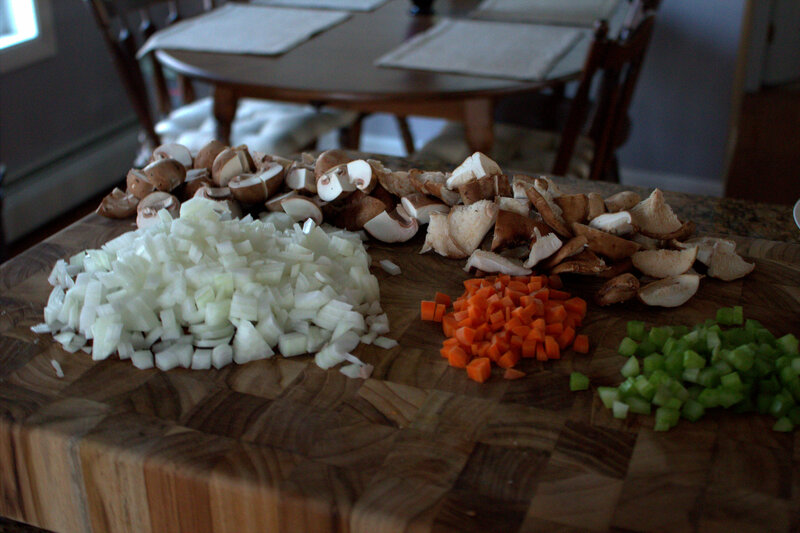 Again, I use a paring knife to show you where to cut. 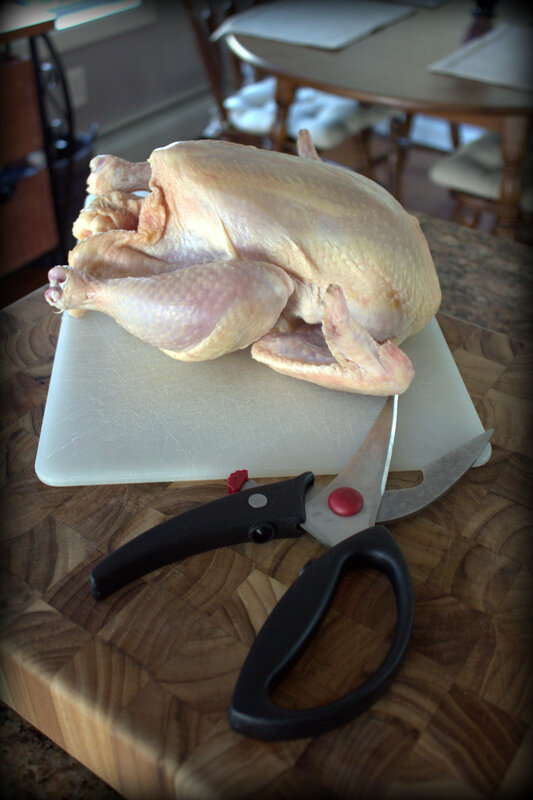 I use my poultry shears to cut at the joint, releasing the leg from the thigh. You can keep the thigh on if you prefer. Next I approach the thigh. Make a cut before the first rib, it’s that easy. I like this because I can control the pieces I get and the amount of fat. You can leave the wing on but personally, I like it separate so I can pick it up and gnaw it like a caveman. 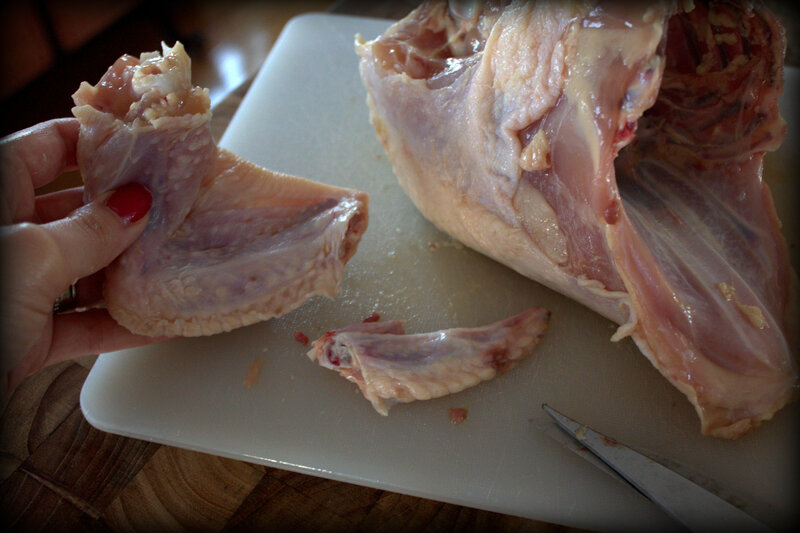 Use your shears to cut through the joint and snip the wing tips off. Lastly, go after the breast meat. 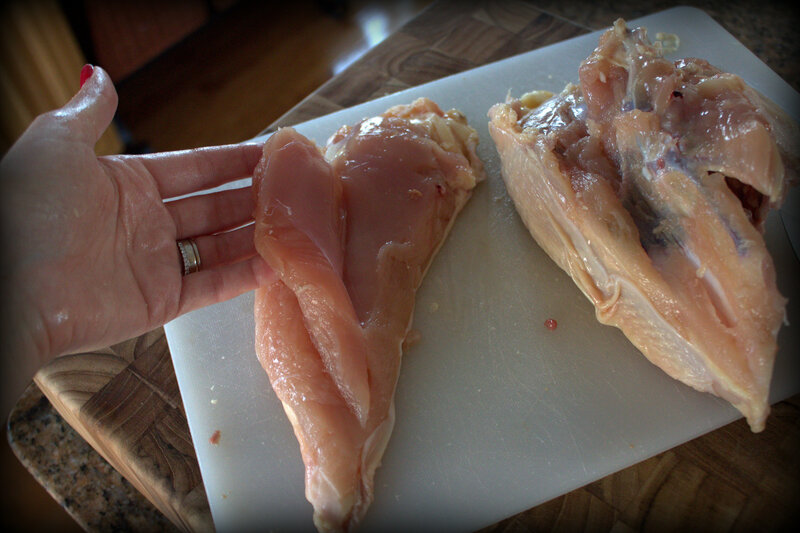 Just make gentle slices along the breast-plate and it lifts right off. Oh look, there is the tenderloin you buy in the store for like $8.00/lb! 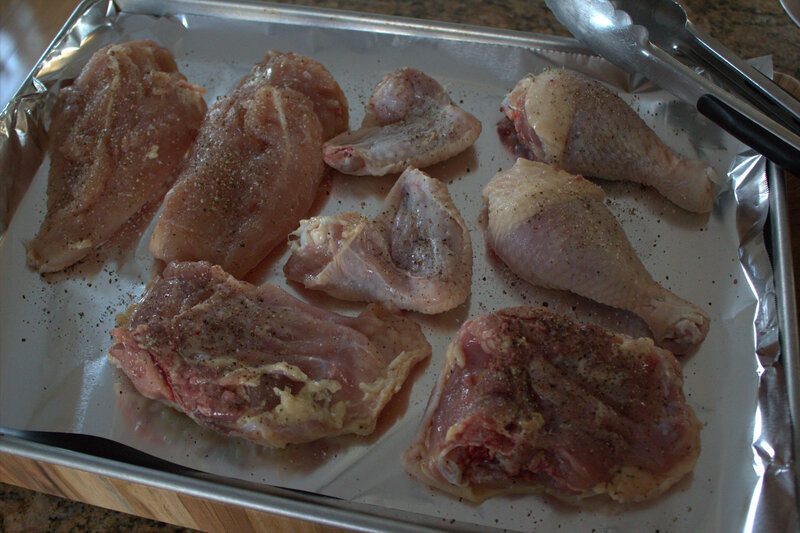 You’re done – just set your pieces on a foil lined baking sheet and season both sides with salt and pepper, I use kosher and I’m not shy. This is the only time you will be adding salt. I took a picture but I’m not posting it because I assume most people will gag – save the carcass, the spine, and the wing tips in a freezer safe container with a pop top. Once you accumulate enough parts, you can make your own stock at home and it’s better than anything you’ll buy in the store. I like to make sure the chicken has had a chance to reach room temperature, air dry a little, and absorb some of the salt. So grab a heavy dutch oven and preheat over medium-high. My stove top runs hot so medium was enough for me. That’s another important tip when following recipes, know your equipment. 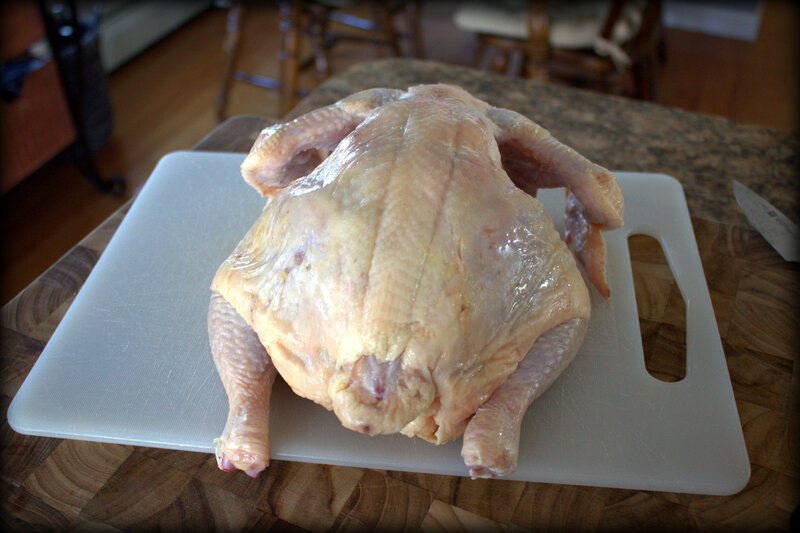 Add the butter and the olive oil – when the foaming action stops, add up to half of your chicken parts skin side down. I was able to do two batches without crowding my pot. Let the chicken brown for 5 minutes per side and develop a nice golden crust. 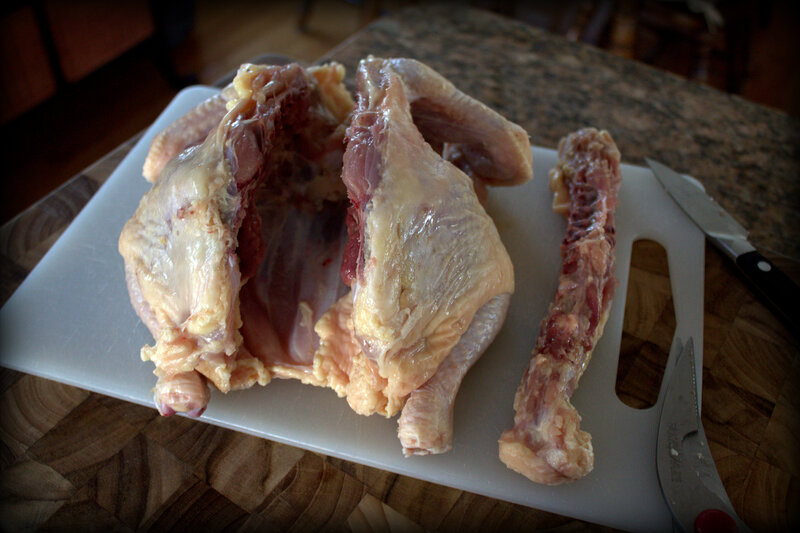 Transfer to a plate until you’ve worked through all your chicken. Hopefully you prepped your vegetables, this really does make cooking a much easier process. 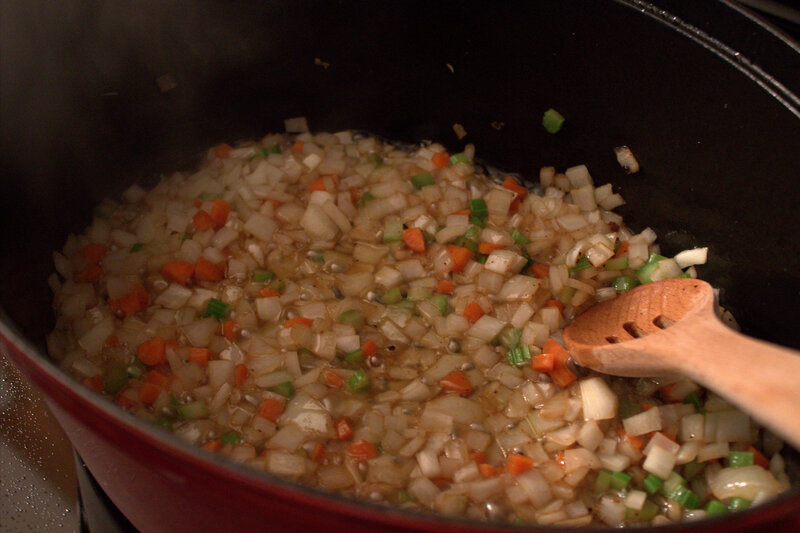 Now add your mirepoix, reduce the heat a little so the delicate vegetables don’t scorch. 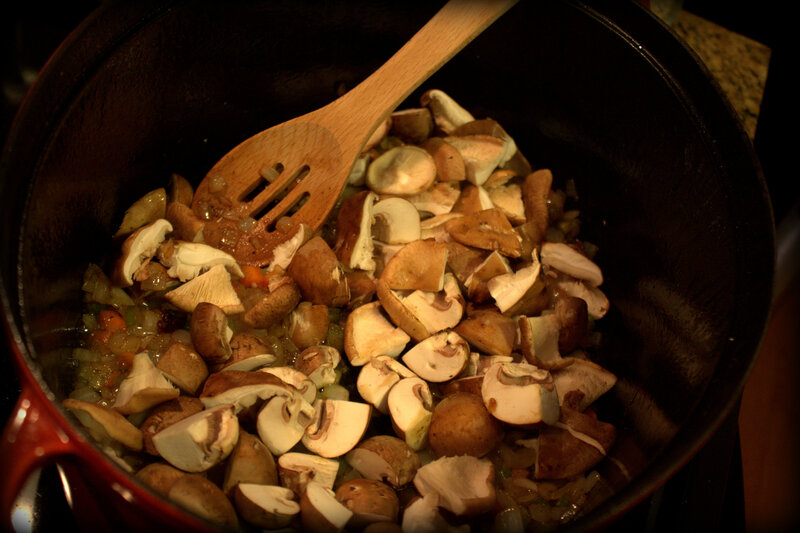 When the veggies are soft and golden brown, add the mushrooms. I don’t think I could live in a world without mushrooms. Meanwhile, make your bouquet of herbs. I always have a spool of kitchen twine, it’s a helper in the kitchen. 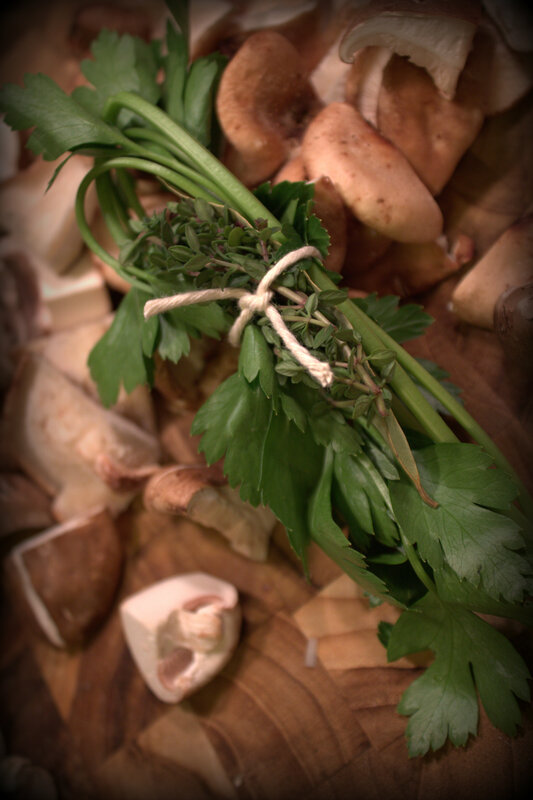 Tie your parsley, thyme, and bay leaf together so you can easily fish it out when the dish is done – or don’t, that’s cool too. Use a wooden spoon to mix until the flour disappears. 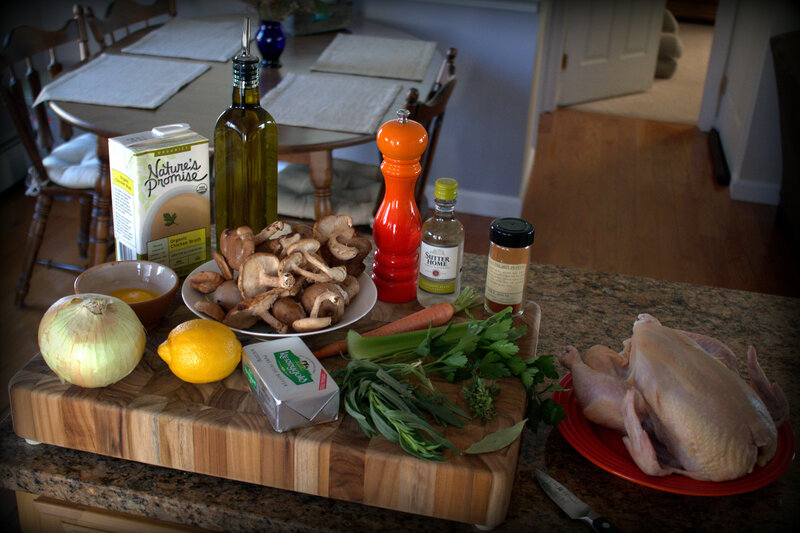 I do not follow Martha’s next steps, instead I add the broth and wine at the same time – it still thickens. So add your liquid and bring it to a simmer. 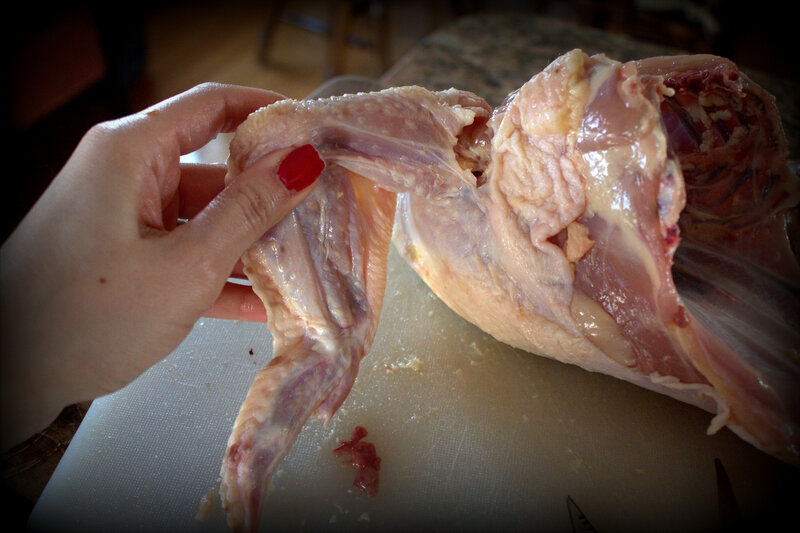 Next, add your chicken pieces back in the pot, skin side up. Any accumulated juices on the plate should go in as well. Toss the bouquet in with the liquids. Let this simmer for 25-35 minutes, or until an instant-read thermometer registers 165 in the thickest part of a breast piece. You’re almost done. 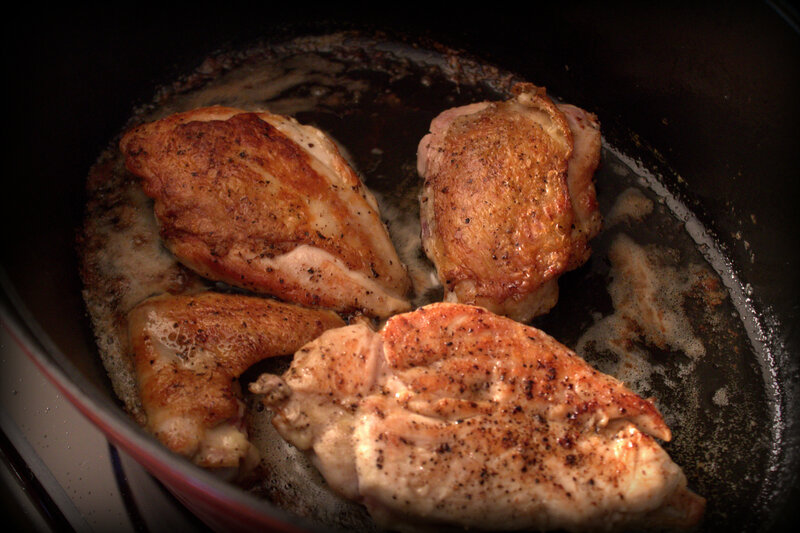 Transfer the chicken to a clean plate and simmer the liquid uncovered for another 5 minutes. 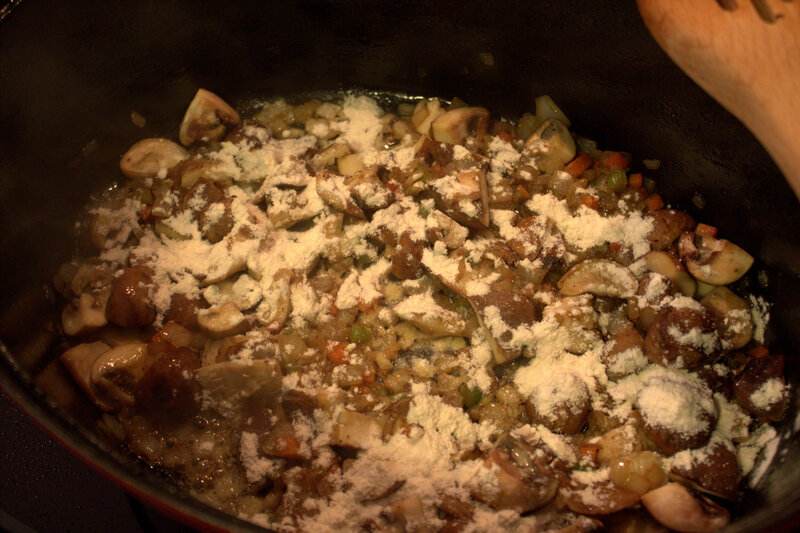 This will allow it to thicken up a bit more and reduce slightly. Fish out your herbs and throw them away. Meanwhile, make the Liaison – in other words, whisk the egg yolks with the half & half in a small bowl and then temper it 1 tablespoon at a time with cooking liquid. By doing this you avoid curdling once the egg and cream are added to the pot. Use up to a half cup of cooking liquid – I eyeball the amount and stop when the metal bowl feels warm against my hand. The finishing act! Isn’t that the most cheerful whisk you’ve ever seen, ever!? 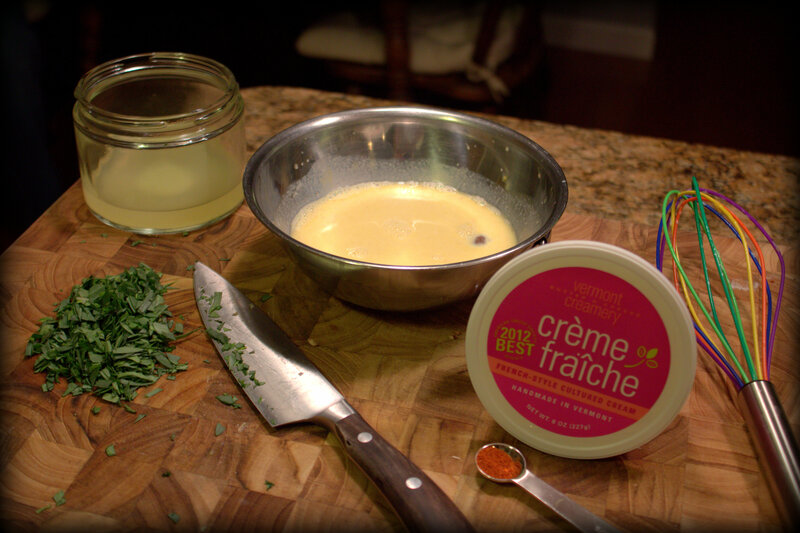 Add the liaison to the pot, swirl in a dollop of creme fraiche, your tarragon, cayenne, and lemon. 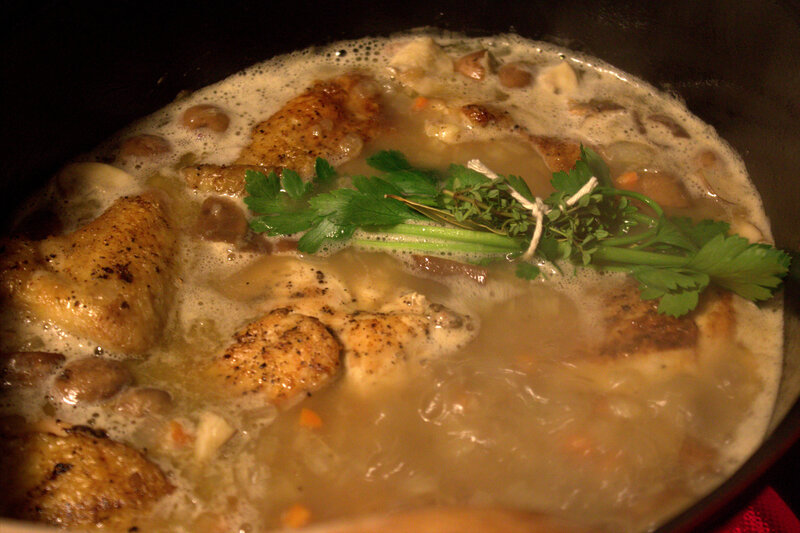 Return the chicken to the pot, let it come back to a simmer and serve. Who needs a french restaurant – not I. You can serve this over a number of things: egg noodles, whipped potatoes, wild rice, bow tie pasta, polenta, pappardelle, you choose! I happened to have farfalle on hand so that is what we went with. Sorry for the bad lighting, I couldn’t wait to dig in! Happy Sunday guys! On the agenda tonight – Meyer limoncello making with friends followed by dinner out on the town. I love this weekend! 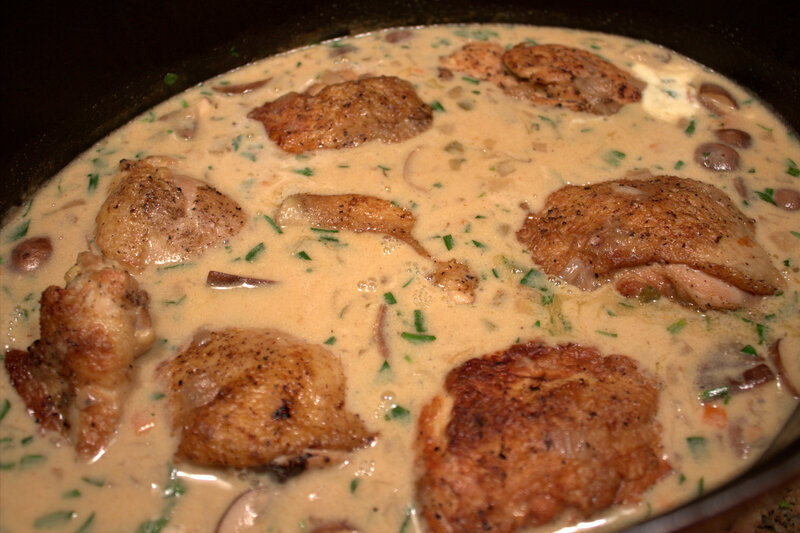 This entry was posted in House Favorites, I Can Do That, Sunday Dinner and tagged Chicken Fricassee, Chicken Recipe, French cooking, Mushrooms, Rustic on March 10, 2013 by NewEnglandGirl.